SOLD A Mogok untreated sapphire with fantastic color, 1.85ct. SOLD This untreated Burmese sapphire has sparkling brilliance, is heart shaped (the romantic shape,) mixed cut with excellent clarity, lovely luster and tremendous color. We think this gem of gems will fulfill your desire for that extraordinary gem. Approximate dimension as follows; 6.5 mm x 8 mm x 4 mm deep and weighs is 1.85ct. This sapphire comes with a copy of an independent lab identification / origin report. 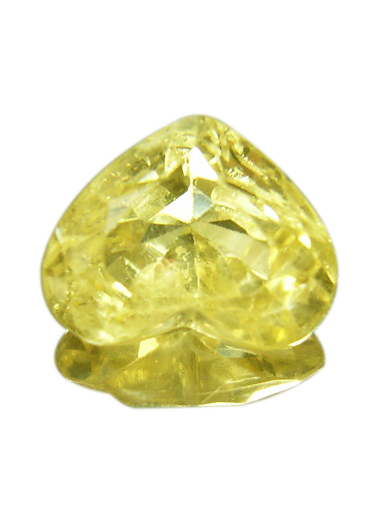 Yellow Sapphires like this are said to give good luck, fortune, wealth, prosperity, valor and fame. The wearer of yellow sapphire gets the knowledge of law, ethics, wit, wisdom, pleasure of getting issues, worldly happiness, Para physical bliss, physical power, cleverness, long life, good health, food grains, prosperity glory and mental peace.